Do you live in Stuart? 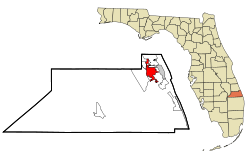 Stuart is a city in and county seat of Martin County, Florida. Located on Florida's Treasure Coast, Stuart is the largest of four incorporated municipalities in Martin County. The population was 15,593 in the 2010 census.It is part of thePort St. Lucie, Florida Metropolitan Statistical Area. In the 18th century, several Spanish galleons were shipwrecked in the Martin County area of Florida'sTreasure Coast. The multiple wrecks were reportedly the result of a hurricane, and the ships were carrying unknown quantities of gold and silver. Some of this treasure has since been recovered, and its presence resulted in the region's name. In 1832, pirate Pedro Gilbert who often used a sandbar off the coast as a lure to unsuspecting prey, chased and caught the Mexican, a US merchant ship. Although he attempted to burn the ship and kill the crew, they survived to report the incident, ultimately resulting in the capture and subsequent execution of Gilbert and his crew.The bar from which is lured his intended booty is named "Gilbert's Bar" on nautical charts. The Treasure Coast area that became Stuart was first settled by non-Native Americans in 1870. In 1875, a United States Lifesaving Stationwas established on Hutchinson Island, near Stuart. Today, the station is known as Gilbert's Bar House of Refuge and is on the National Register of Historic Places. The city of Stuart is known as the Sailfish Capital of the World, because of the many sailfish found in the ocean off Martin County. Between 1871 and 2005, 19 hurricanes have passed through Stuart, including Isbell (1964), Frances (2004), Jeanne (2004), andWilma (2005).